BrightPay can track employee hourly rates against the National Minimum/Living Wage (including apprentices), UK Living Wage, London Living Wage, or they can be marked as not eligible. 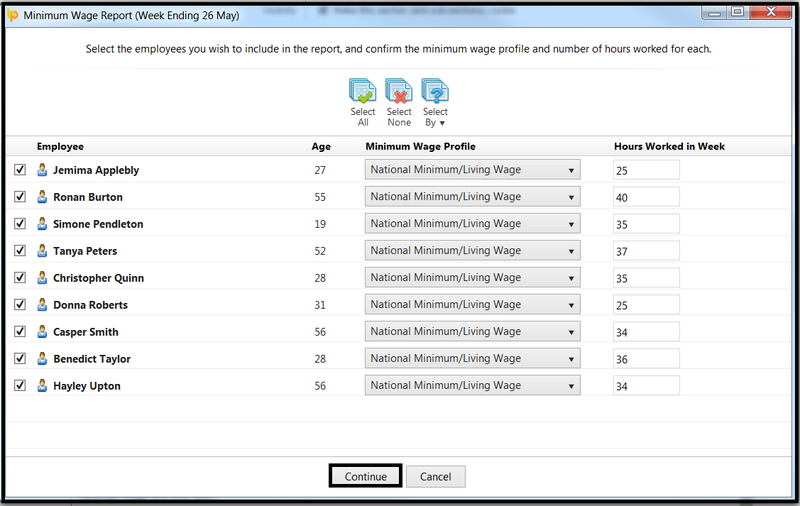 An employee’s minimum wage setting can be set at 'Employee Details' > 'Employment' tab > 'Minimum wage profile', or alternatively, in payroll via 'Edit Settings' button > 'Employment' tab > 'Minimum wage profile'. To enable BrightPay to test whether an employee is receiving the National Minimum Wage, BrightPay needs to know the number of hours worked for each period. For hourly paid employees, this is automatically calculated. Using the employee's age (on pay date), number of hours worked in period, and minimum wage profile, BrightPay can determine the effective hourly rate used and compare it against the required minimum hourly rate. To help with non-hourly employees (or for workforce reporting in general) there is a feature in 'Payroll' > 'More' > 'Minimum Wage Report'. This allows you to enter/confirm the number of hours worked for each employee and generate a summary to see who passed minimum wage and who didn’t. When the report is displayed you will the result for each employee i.e. pass or fail. When BrightPay detects that an employee's wage is below the National Minimum/Living Wage it will indicate this using a yellow status bar within 'Payroll'. If the Minimum Wage Settings are incorrect or you wish to turn off the Minimum Wage flagging you can use the edit button to make the relevant changes.